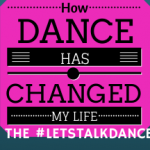 Overcoming Guilt As A Dancer - The Let's Talk Dance Blog - Empowering Dancers To Create A Better Quality of Life! Don't let guilt overtake you! Do you ever feel guilty about the choices you’ve made for your dance career? Do you feel guilty about getting paid to do something you love so much, and would do for free? Do you feel guilt about choosing a career path different from what your parents/family thought you should choose? Guilt about not living up to your own expectations? Do you feel guilty about not spending enough quality time with your loved ones, because your life is so busy? Guilt is real, and it’s something that many of us feel on a regular basis, for a number of different reasons. It’s an emotion that will definitely get the best of you, if you don’t keep it in perspective. It’s always best to get to the heart of why you’re feeling guilty in order to address in the best way possible. Don't Let Others Guilt-Trip You! 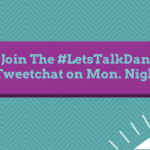 Last night on our weekly #LetsTalkDance Tweetchat, we discussed the topic, “Overcoming Guilt As Dance Artists”. 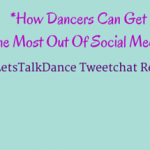 When I asked the question, “What is the one thing you’ve felt most guilty about throughout your dance career?”, many of our dance Tweeps had expressed feelings of guilt for different things in their career. 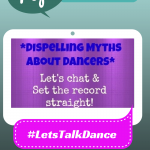 Apparently us dancers, have some serious guilt issues. @thedancebuzz: I feel most guilty about spending too much time away from family/husband for dance. @morphing: I feel guilty abt not taking gr8 care of my body-pushing myself 2 far, eating 2 little/poorly,sleep- 2 little. @jordoncloud Lately I’ve just been guilty about not having the time to dance as much as I’d like. Not enough energy, either! @kinerenterprise Have definitely struggled with balancing performance career vs. teaching. Selfish vs. Non-Selfish. @SheenaJeffers Some days I feel guilty about not moving to NYC. Because I grew up with training that NYC is THE ONLY place to go to make you a “legitimate” dancer. @SaintElasticat Guilt about not working hard enough. @mochazina: Evaluate the legitimacy of the feeling, then take practical steps to address it. @jordoncloud: A personal confirmation that Im making the decisions that make the most sense for my life at the moment. @KarenatashaB: I cant do anything about childhood decisions…Either work harder or realize I am working enough! 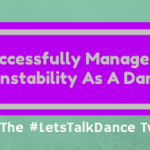 @thedancebuzz: Setting priorities and sticking to them… not always easy though. @kinerenterprise Remind myself of WHY I’m doing what I’m doing. Remind myself that God has me exactly where I’m supposed to be. Remind myself that I deserve to be happy, & that God gave me this passion for dance for a reason. @Joshua_Legg: I embrace the choices I’ve made. Good, bad, indiff., theyve gotten me where I am. @SaintElasticat: Realize that Im doing the best that I can…..
@KarenatashaB: I take it one day at a time, assess things & try to make it better the next day. Thats with everything. I try not to beat myself up. If Im doing that Im not writing, dancing, or working constructively. @jordoncloud: One foot in front of the other,being productive w work/school, spending time w family friends & boyfriend. @mochazina: Try to set daily schedules that align with long term goals Ive planned. Im not always faithful tho. @5six78: Seek out inspiration by listening to music, watching dance, reading quotes, Pinterest. @SaintElasticat: Meditate, care for my body/mind/spirit, attempt to self-soothe when down, friends, love, have fun, rest, drink WINE. @drawplease: Without balance there’s no standing on the balls of ur feet & we know how important that is. Balance is definitely key. I think what matters most is that you understand very clearly, why you’re doing what you do everyday, what your goals are, and make sure that your actions line up with those goals. It’s also super important to live a balanced life. When you get out of balance, all sorts of negative feelings will pop up, including guilt. Just remember, when guilt creeps up on you, via your own mind, or other people, quickly eliminate those negative thoughts by asking yourself the questions above, and then give yourself a break! Focus on all of the wonderful things that you have accomplished, and the positive impact that you’ve made on the lives of those around you. Focus on the positive, and recognize how far you’ve come. You can always make changes, and start fresh. Be inspired! You may not be where you want to be, but thank God that you’re not where you used to be! What guilty feelings have you struggled with in the past? How did you overcome them? Please write your comment below. Share this post on Facebook and Twitter, if you found it to be helpful or if you related to it in some way.